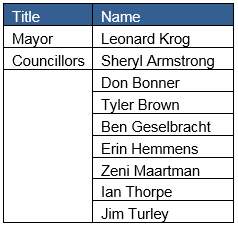 The City of Nanaimo is administered by Mayor Leonard Krog and eight Council members. Municipal elections are held every four years, with the next election to be held in October 2018. City departments include Engineering & Public Works, Corporate Services, Legislative Services, Community Development Services, Parks & Recreation, and Fire Rescue. For additional information on City Hall, please visit http://www.nanaimo.ca/ or call (250) 754-4251. Policing services are provided by the Royal Canadian Mounted Police (R.C.M.P.). There are approximately 186 R.C.M.P. officers serving the Nanaimo area of which 142 positions are funded by the City of Nanaimo. Fire protection is provided by the City of Nanaimo Fire Department from five fire stations located around the city. There are 81 full-time firefighters and 37 paid on-call firefighters. Nanaimo boasts over 200 parks, 63 playgrounds, 3 pools, 4 indoor ice rinks, 3 golf courses and numerous beaches and picnic areas. Residents can enjoy a leisurely stroll along the waterfront sea wall, or a vigorous hike up Mount Benson. The City’s Parks, and Recreation Department provides a comprehensive year-round program of activities for residents of all ages and interests. Newcastle Island, the charming provincial park just off the shores of downtown Nanaimo, is a popular summertime picnic and camping area. Buttertubs Marsh, in the heart of the city, is a wonderful place to view waterfowl and learn about our delicate ecosystem. Neck Point Park is a 14.5-hectare waterfront park known for its views and natural features. The park has a vast trail system of varying lengths and difficulty and offers a number of amenities including picnic areas, viewpoints and lookouts. The Linley Valley is a 5.8-hectare undeveloped park recently acquired by the City of Nanaimo. The Linley Valley contains many old growth trees, open meadows and wetlands. Residents enjoy the informal walking trails, the beautiful scenery and the abundance of wildlife. During the late fall and early winter months, Nanaimo becomes home to thousands of Stellar and California sea lions; bald eagles grace our skies throughout the year. Outdoor adventures include paddling, hiking, biking, golfing, bungee jumping. Those ocean waters are the source of many activities, including sailing, fishing, and kayaking. Spend the day paddling around Newcastle Island, or get out on a charter to become the next great angler. Take your adventure to new depths on a snorkeling or scuba diving expedition. Beaches at local ocean parks such as Piper’s Lagoon, Departure Bay, Neck Point, and Swy-A-Lana Lagoon, offer a myriad of opportunities for swimming, windsurfing, and snorkeling, complete with incredible sea life just below the surface. Sea life abounds in the cold, clear ocean that surrounds Nanaimo, making it the ideal destination for scuba diving. Jacques Cousteau considered these waters “the best temperate diving in the world, second to only the Red Sea.” Nanaimo is home to 3 fascinating wreck dives. In 1997 The HMCS Saskatchewan, a 366-foot navy destroyer, was sunk off the shores of Nanaimo to create an artificial diving reef. The Saskatchewan was joined on the ocean floor by the HMCS Cape Breton, a retired Canadian Supply Ship, now recognized as the World’s Largest Artificial Upright Reef. In February of 2005, the Nanaimo Dive Association sank a third vessel, the RivTow Lion, a retired deep sea rescue tug. The Rivtow rests at a manageable depth of about 50 feet in Departure Bay, making it a great dive for beginners seeking some experience before plunging down deeper to the Cape Breton or Saskatchewan. Shopping in Nanaimo gives you the best of all worlds, from major big name retailers to funky one-of-a-kind shops and boutiques. Nanaimo boasts more than a dozen indoor and outdoor malls. Nanaimo, the island’s “shopping mecca” offers major brand name retailers in Woodgrove Centre (the largest shopping centre on Vancouver Island), Port Place Shopping Centre, Country Club Centre and Nanaimo North Town Centre. Downtown Nanaimo features three distinct shopping districts: The Arts District in the city core, the Old City Quarter up the hill, and the Waterfront District along the Harbourfront Walkway, each offering distinctive shops and services. The widest selection of Nanaimo restaurants can be found in the downtown core. Some kitchens are geared toward the nightlife, combining a stylish urban atmosphere with fancy drink menus, while others are situated in character Victorian-style homes, and serve the finest in high-end international cuisine. Nanaimo has 4 floating restaurants. Other parts of the city, like mid-town, and the north end, also have a great variety of cafes, restaurant chains, classic diners, pubs, and fast food outlets. Nanaimo is known as the home of the Nanaimo bar, a Canadian classic with rich chocolate, filling and a nut and coconut base. Our iconic dessert can be sampled in traditional form, with variation and even as cocktails and coffees. Taste craft brew at its finest in Nanaimo. Stay local or venture along the Nanaimo & Comox BC Ale Trail or the Cowichan, Nanaimo & Parksville Qualicum trail to sample brews at three breweries in Nanaimo as well as at their neighbours on Vancouver Island. Nanaimo has a growing community of musicians, dance companies, museums, artists, as well as several active community theatre groups and a symphony orchestra. Residents enjoy a variety of entertainment throughout the year. Nanaimo is famous for its love of quirky fun, which truly kicked off in 1967 when a former mayor of Nanaimo famously donned a pirate costume, raised his sword and launched Nanaimo’s first annual Bathtub Race. “Tubbers” and visitors from around the world have been coming to Nanaimo for more than 40 years to take part in this now world famous festival and race. Bathtub Races is just one of our many festivals and events in Nanaimo. Check the Tourism Nanaimo calendar of events for exciting events, everything from wine and food festivals to the Diwali Festival of Lights, the Nanaimo Pumpkin Festival and more. In the city centre, a wide variety of art galleries and music venues share the street with bookstores, hip cafes, and fine boutiques. The city is full of heritage buildings and Nanaimo museums are packed with artifacts from the city’s coal mining era, and First Nations communities. Historical sites include the Hudson’s Bay Company Bastion, the Great National Land Building, and dozens of old storefronts and bars along Victoria Crescent and Commercial Street. There are several downtown Nanaimo art galleries in all, including a renovated heritage building that provides an inspirational 10,000 square feet of space to display the paintings, pottery, glass sculptures and other extraordinary works of many Canadian artists. Within the Region, you’ll also find quaint home studios and even a few studio tours in which you can self-guide your way through the arts! Dozens of lively nightspots and performance spaces throughout the city offer a good time whether you’re here for a weekend party, or looking for some evening entertainment. Many live music acts perform at downtown Nanaimo bars in the Commercial Street/Victoria Crescent area. Diana Krall Plaza, the courtyard between the Port Theatre and the library is often used for street performances and during downtown festivals and events. The performing arts offer a rich source of cultural entertainment in Nanaimo. The Port Theatre is the largest venue, holding more than 250 performances a year, attracting over 100,000 fans of music, theatre, literature and dance. Nanaimo also has a professional theatre company called TheatreOne and the Nanaimo Theatre Group, an award-winning community-based company. International jazz greats Diana Krall and Ingrid Jensen are both former Nanaimo music students. Just steps away from the scenic Nanaimo Harbour in the heart of a walkable downtown, the Vancouver Island Conference Centre is Vancouver Island’s finest full-service convention centre. Since opening in 2008, our award-winning Nanaimo conference venue has been recognized for exceptional service, building design, sustainability and high-tech innovation. This new 38,000-sq.ft. conference space is BC’s venue of choice for small and mid-sized meetings, conferences, tradeshows and weddings for up to 1,300. The City of Nanaimo Visitor Information Centre is located at 2450 Northfield Road, on Highway 19 at the Northfield exit. The friendly staff will provide you with personalized visitor information, friendly service and professional advise. Nanaimo has three branches of the Vancouver Island Regional Library. The Central Reference Service is also located in the Nanaimo Harbourfront branch. About 1 million books, magazines, videos, cassettes, newspapers and other material are available in the branches or through inter-branch request service. Each branch also offers access to the Internet and other electronic information sources.